I arrived home to find a lovely surprise on my doorstep. There were the flowers and box of chocolates that Interflora had sent me to review. When they asked me to review one of their Mothers Day Gifts, I jumped at the chance. We are all mothers, who have mothers, so it is a fantastic product to have. I was given some links on their website to browse, and I had a good old root through all the products they have on offer for Mothers day. 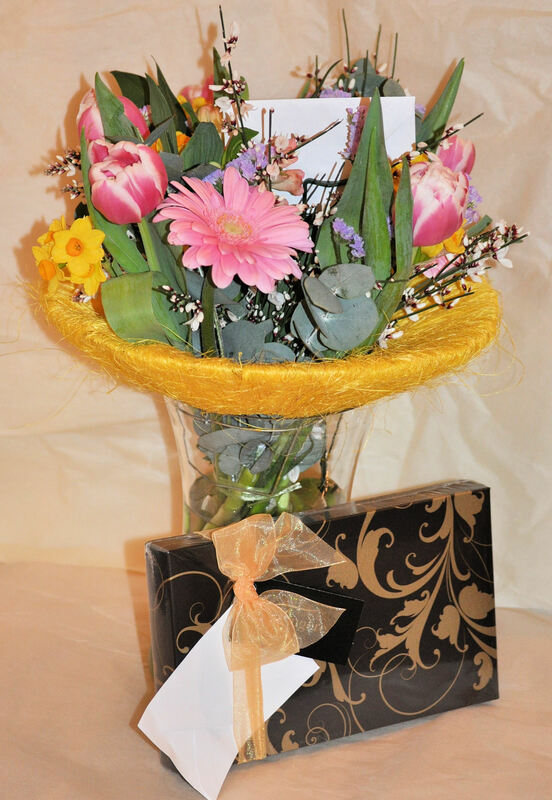 There was a huge choice on offer, from hampers in the Mothers day gifts section, through to gorgeous Mothers day flowers, and the absolutely fabulous Spring flowers. As a mother myself, and with special needs children, a bunch of flowers appearing in our house is a rare occurence. The only flowers that I usually see are the ones that I buy for other people. I decided that, for me, a gift with some chocolates would be appreciated in our house, with the flowers for me, and the chocolates for my children. It gave me the best of both worlds. As tempting as the Spring Gift with a bottle of wine was, I think my children appreciated the chocolates a lot more. I chose the Scented Spring Perfect Gift with Chocolates, which was priced at £31.95. I picked up the vase, with their box of chocolates and eagerly took it into my kitchen. I tried to take a nice shot of the flowers, but I’m not a professional photographer, so please forgive the shots if they look slightly amateurish. Here are my flowers in all their glory on my mantlepiece, and they certainly brighten up my room. The smells were absolutely fantastic as I walked along my corridor. Even my husband who is usually florally challenged said that they had a lovely smell. 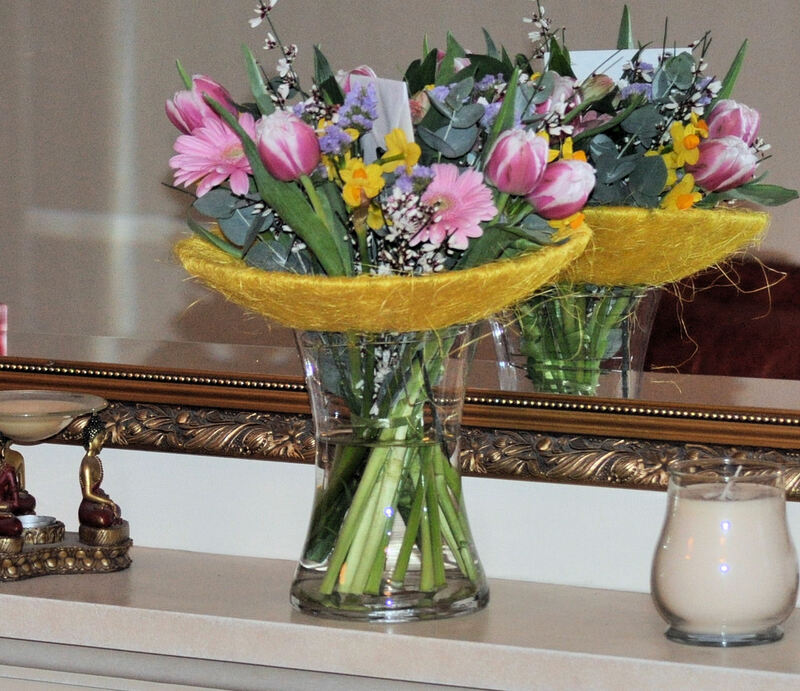 I was surprised to see the flowers were in the vase, with water already in it. I am guessing it is to preserve the life of the flowers, and for me it worked. I loved them just for the smell. The vase is quite a sturdy, heavy glass, definately a substantial vase. The chocolates, well, they were lovely, as my boys could tell you. The box is rather nice, and with the little chiffon ribbon, looks very swish. Inside the box, the Maison Fougere chocolates for Interflora looked lovely. With 12 gorgeous chocolates, in a mix of dark and milk chocolate, there was something for all of us. There was even a competition here for who would get the red heart….You can hardly make out the red heart in this picture, but it really was a vibrant, lovely shade of red. Apologies for this photo, as the chocolates have now been eaten, and I have no chance to take a better one. The best part of all this, is that Interflora are allowing me to give away the same gift set that I received as a gift for Mothers Day. You, or your choice of recipient will receive the same bunch of flowers, with chocolates and the vase, and you can choose your own message to put on it. You can see the gift set on the website here. 1. Make sure you either follow me on twitter, or google friend connect my blog if you haven’t already. If you want to do both, thats fab by me. 2. Hop on over to Interflora using the links on this post, and tell me in a comment how many gift sets Interflora are selling in their mothers day categories. These two things entitle you to one entry. The competition closes on Sunday 27th March 2011 to allow the winners entry to go through for Mothers Day, which is on Sunday 3rd April. The winner will have to claim their prize before midnight on Monday 28th March. If it is not claimed by then, it will be given to the runner up, via selection through random numbers, of the entrants. Good luck everyone. It’s going to be a lovely arrival on someone’s doorstep. I am following your fab blog and your twitter page. I am @V1cki_Lou! The answer is 18 gift sets. Would love to win pls. Am following you on here and on twitter. Will go tweet now too. I am going with 18 sets. I’m going for 18! I am following your blog and following you on twitter. am following you on here and twitter. according to my maths, well having gone to mothers day shop then mothers day gifts then looked at once marked gift sets there are 17, different answer to most of the above which is worrying, one has a bit saying save £10 on the rose and tulip habd tied chocolates so dont know if it possibly had been, but at this time of today my answer is 17. I’ve looked and counted and counted again and I think it’s 17 but I see lots have said 18! Anyway- I’d love to win this for my mum! Happy mummy day to you all! hello, i follow yr blog and on twitter @sandigled. the answer i think is 18 giftsets for mothers day. thank you prize looks lovely! Following on twitter @mrsmildredroper and have tweeted. There are 18 gift sets. I already follow your blog and twitter as @superamazingmum. Now, the answer is either 17 or 18. 17 say Gift set but there are 18 if you include the one with save £10 banner! I am following you here and twitter and it’s 18 gift sets and have RT . I am going with 18 and counting the one with £10 off Rose and Tulip Mother’s Day Hand-tied with Chocolates as a gift set. I made it 29 different gift sets across all categories. The one with the £10 banner says “Gift Set” in the description, so I counted that in too. Following on GFC. I think the answer is 17 gift sets. Thanks. Ummm I am gonna be a weirdo and say – 17!!! Hi am following on GFC and twitter, 17 gift sets I think! I counted 17 gift sets! The answer is 18 links , beautiful flowers in a sturdy vase, the chocs looked yummy too. I have followed your blog now on twitter too @mumsmyname . I counted 18 Mother’s Day Gift Sets – they are lovely! I have counted 17 gift sets and hope I’m in with a chance to win this great prize. I’m following you on Twitter as @caro_mad and am also following you blog. Have also RT’ed the link to the competition. Have tweeted (had to amend slightly to fit it in, hope that’s ok). Hi I follow you on twitter. I spot 18 gift sets, good choice by the way the flowers are beautiful. I follow you on twitter (@Melaina25) and there are 18. I am following with google friend connect and hopefully about to on twitter. The answer is 18 mothers day gift sets and they are gorgeous. Good choice – absolutely gorgeous!! Oh I’d love to get this for my mum! I’m already following you on twitter, and have rt’d, and follow you on GFC! I am following you on twitter and also google friend. That’s fine. Most twitter apps shorten the link, but sometimes we have to do it ourselves.